The Tea Party Facebook page posted this Monday night. 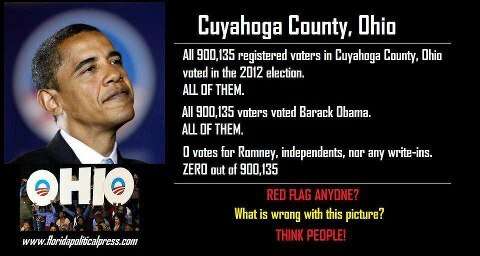 Here are the results of the Nov 6th 2012 election for Cuyahoga county Ohio.. A simple Google search found this. I apologize in advance for the the language but - why do people think they can get away with spreading this bulls**t? P.S. I've updated for the official certified results, which were not significantly different from the 'unofficial' results published on the day. The graphic attributes the data to "www.floridapoliticalpress.com". an unknown individual created an image [...] based on the aforementioned article, distorting the information within and then tagged Florida Political Press as the verifying source of this blatantly false production. With an assist from a reader, I was able to track the photo to a FaceBook page titled ‘Let’s Make Fun of Liberals – A Political Stomping Ground‘… ironically, it espouses the virtues of free speech. While the page does not identify who is behind it, I was able to send a message requesting that the image be deleted – thus far, no response.